Be Peaceful Face Anger Positively. 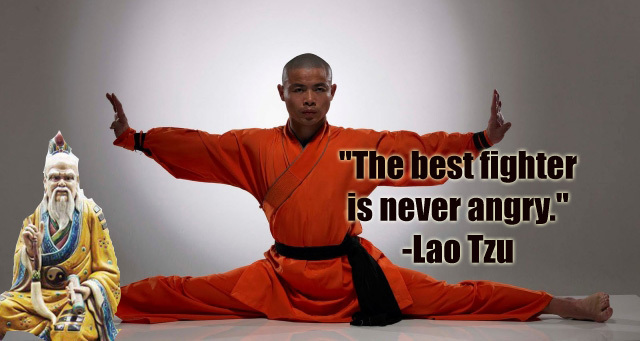 "The best fighter is never angry"
A meaning full Saying by ancient Chinese philosopher Lao Tzu ( 6th-5 th century BC).Laozi was the founder of Taoism. Do you know a decision we take when we are angry is a bad decision always? A peaceful mind is needed to take optimum choices. It is not possible to take good decisions by a person with a depressed mind. Thoughts results actions. Hence, negative thoughts give rise to negative actions. Who wins a fight when two people fight each other. One fight with anger, jealousy, sorrow. The other fight with joy, peace and hope. The answer is possibly one who fight peacefully. We can consider many other things to relate to his saying surely. If a child is preparing for his final examination, he has to study patiently to get better results. Exam time is the very difficult phase of a student life to overcome. They seem so tensed to complete the syllabus. Most schools offer motivational class to inspire their students these days. A tensed student cannot write well in the exam hall also. So if you are a student you have to study your subject with peace and patience. For an employee, there is no difference in fact. We know how hard everyone works in this world. Everyone has got many deadlines in professional and personal life. Peace and patience are the two necessary positive qualities which everyone needs to cultivate in life. Life is something which always gives adverse situations and frustrations to everyone. So how to cultivate these positive skills? You have to start spending your time to read books and Motivational stories. So many resources are there on the internet too. A small tip I will say is to start a new habit. Ask yourself how peacefully you spend your day and ask it every night before going to sleep.